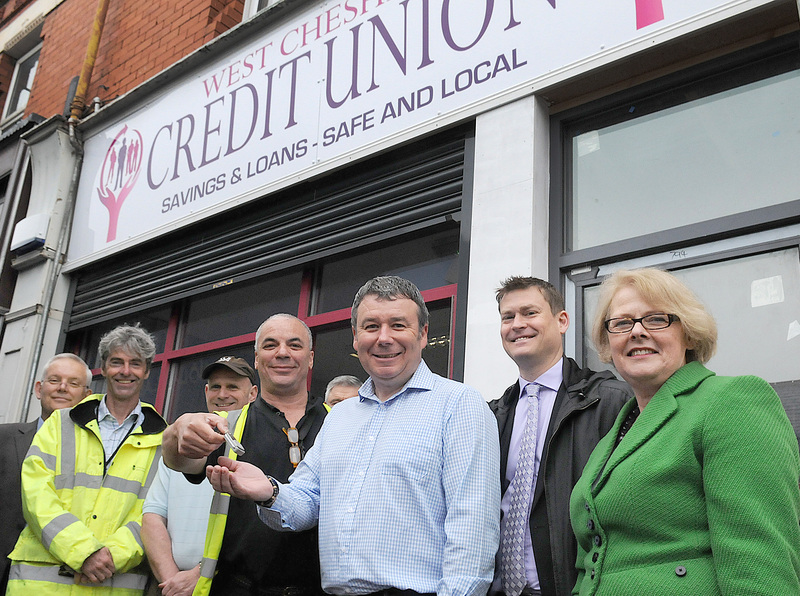 3 June 2014 – The West Cheshire Credit Union – which provides local residents with affordable saving and loan products – has officially opened its doors on Ellesmere Port’s Whitby Road. In yet another boost to the town’s high street this is the first shop to be opened by the Union, which had previously been based within Ellesmere Port market and Trinity Church. The organisation will now benefit from being located on the high street, close to the Citizens Advice Bureau. Relocating to 13 Whitby Road as part of the Council’s Empty Shop Refurbishment Scheme, the Union will benefit from a two-year peppercorn rent from landlord Access2Training&Employment, which bought the property and refurbished the shop. Six affordable flats have also been created above the shop which will be allocated through the Council housing waiting list in the next few months. The Credit Union is the latest in a long list of successful new ventures being attracted to the Whitby Road High Street following prioritisation by Cheshire West Council and the Ellesmere Port Development Board. The historic high street of Ellesmere Port, Whitby Road has seen its vacancy rates drop from twice the national average of 24 percent two years ago to 7 percent this year, half the current national average. Neil Jay, Manager of West Cheshire Credit Union, said: “This is a major development for us and will contribute toward further rapid growth of our business, ensuring we are more visible to Ellesmere Port residents. “In collaboration with partners such as local housing associations and the Council promotion of our new shop will be targeted at those who would value access to safe savings and affordable loans. “Our loan rates are hard to beat compared to the plethora of pawnbrokers, money shops and payday lenders that have taken a stronghold on the high street and we need to educate residents that there are viable alternatives. The Credit Union now benefits from a highly visible shop frontage on a busy road with a self contained shop and office where it can help to offer a real alternative for residents to high-interest money lenders and loan sharks – a key issue for the Council. Deputy Leader of the Council and Executive Member for Resources, Eveleigh Moore-Dutton, said: “Today marks a number of milestones for me in the plans to get Ellesmere Port’s town centre revitalised and also to add pressure on loan sharks and the extortionate money lenders that have exploited local people. “I fully support the credit union and its work and I have shown this support personally by joining. West Cheshire Credit Union is a practical solution to people who want their savings to help other people who need to borrow money at more affordable rates. Gary Williams, Project Manager of Access2Training&Employment, and landlord of 13 Whitby Road, said: “We are delighted to hand over the keys to the Credit Union. We have worked extremely hard to get the empty property ready in time for them to move in and we are proud that we have been able to give local young people valuable work experience during the extensive refurbishment. Local member, Councillor Justin Madders, said: “The use of the Marks and Spencer’s money has really helped to revitalise Whitby Road and the credit union will prove to be an excellent addition to the town centre.